25/1 Watt fixed mount marine radio with JIS8 submersible standards. Features all USA, Canadian & International channels, Rugged rubber grip microphone with channel up/down, scan & instant 16/9 keys, Class D DSC (Digital Selective Calling), large easy to read back-lit Dot Matrix display, user friendly intuitive menu, 10 weather channels with S.A.M.E. emergency/weather alert, programmable channel scan. 3 year warranty. In black. Uniden 25 Watt Full-Featured Fixed Mount VHF Marine Radio designed with a shorter chassis for more versatile installations. DSC (Digital Selective Calling) - Including Distress Button, Position Send and Request. Gives you the ability to press one button to call for help during an emergency. Full Class D DSC capability. High performance transceiver ensures clear communication and helps prevent and reject interference. DSC Position Send and Request - Allows you to send and receive position information between your boat and other boats. Ultra Compact Rugged Construction - Saves valuable space and allows for convenient mounting. Designed to withstand the harshest marine conditions. JIS7 Submersible - This radio has been designed to meet the stringent JIS7 submersible specification of submersion in 1 meter of water for 30 minutes with no water intrusion. Full Dot Matrix Display with Easy-to-Use Intuitive Menus - Provides channel information and feedback for ease of use. The intuitive menu system makes changing settings quick and easy and helps prevent accidental changes. 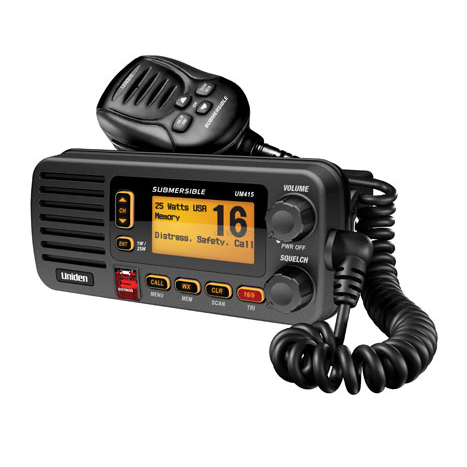 Quik Command ¢ One-Touch Ch 16/9 Key on Mic - In addition to the channel up and down controls, the Quick Command control enables one touch access to the Coast Guard channels 16 and 9. S.A.M.E. Emergency/Weather Alert - Allows you to specify the area that you need to hear any alerts that may be Weather, Civil, Biological, Nuclear, or National in nature. Channel Names - The user can assign names to all marine channels for quicker reference. Backlit LCD Display and Keypad - Allows for enhanced viewing in low light situations. LCD Display and Dimmer - Fully user adjustable LCD contrast setting. Triple Watch Plus ¢ - Allows you to monitor emergency channel 16 and 9, another user selectable channel plus weather alert. Memory Scan - Allows you to scan all channels saved in memory. Weather Alert - When activated, user is notified by NOAA weather signal of inclement conditions. Weather Scan - Hear local weather conditions and forecasts.